ALGIERS, May 8 2012 (IPS) - “Is that your photo on the poster?” a policeman asked a woman standing in front of an electoral campaign board in Algiers. “Why do you ask?” she inquired. “Because only the candidates are interested in these elections,” he replied. The woman was Cherifa Kheddar, president of Djazairouna or ‘Our Algeria’, an association formed to support victims of terrorism. She was, in fact, proposed as a candidate for the general elections slated to be held on May 10, but refused to participate in what many commentators, citizens and activists are describing as a ‘sham’. When Tunisia went up in flames in December 2010, the unrest quickly spread to neighbouring Algeria, where a population of 36 million people was already simmering over the lack of proper housing, rising food prices and widespread political corruption. As polling day inches closer, many of Algeria’s 21.6 million eligible voters are expressing discontent and scepticism that elections will bring any lasting change. Anyone who wanted to be a candidate but wasn’t able to find a place on a party list simply created a new civil list and ran as an independent candidate, she added; but nobody has a clear programme of action. A staggering 44 parties and 183 independent candidates will compete for the 462 seats in parliament, 30 percent of which are reserved for women. “These elections are just a comedy,” Djamal, a shopkeeper on the central Didouche Mourad Street, told IPS. The customers around him agreed. “Nothing is changing, the politicians are all the same, they make promises when they want to get votes but when they are elected they (act) only on their interests,” added Sidi Ali, an unemployed youth. “We are a rich oil country but the money is only for a few people. The majority of us are poor people – I will not vote,” he said. Algeria is the world’s sixth largest natural gas producer, behind Russia, the United States, Canada, Iran, and Norway. A member of the Organisation of Petroleum Exporting Countries (OPEC), the country has raked in substantial oil revenues since 2010, but few besides the country’s elite see the benefits of this wealth. The official unemployment rate in Algeria is 9.8 percent, a figure that rises to more than 20 percent for young people. State officers echoed the sentiments of people in the streets – many told IPS, under condition of anonymity, they wouldn’t vote in the upcoming election. This common feeling of apathy towards the ballot has prompted politicians to call off ill-attended meetings, while opposition rallies or assemblies draw only a handful of activists. Many politicians have taken to holding their meetings in villages or small towns where they have a higher chance of drawing a crowd, since most people in the capital have grown indifferent to politics. 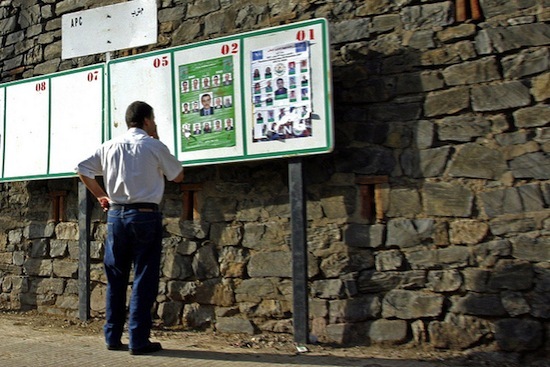 In the popular neighbourhood of Bab al Oued, a former Islamist stronghold back in the 1990s, most election propaganda has been scratched off the walls. Election observers fear that voter turnout will not exceed the 35 percent who graced the 2007 polls. Inspired by the success of Islamist parties in Egypt and in Tunisia, three Algerian Islamist forces merged to form the Islamic Green Alliance, a coalition comprised of the Society for Peace Movement (MPS) – an offshoot of the Muslim Brotherhood – Ennahda and el Islah, in the hopes of snagging a majority of the Islamic vote. The Green Alliance has the support of numerous Gulf countries including Qatar and Saudi Arabia, as well as the Doha-based Al Jazeera broadcasting network. But their local support base is fractured. “MPS has been in power for long time now, and is not reliable as an opposition force. I think that Abdallah Djaballah (leader of the new Islamic Justice and Development Front or JDF) is more appreciated by the (population),” sociologist Nacer Djabi told IPS. Opposed to an alliance with MPS, Djaballah left el Islah to form the JDF, thereby weakening what would otherwise have been a united Islamic front and lessening its chances of victory at the polls. Still, the result depends on the turnout at the ballot boxes this Thursday. And in an ironic twist, the party that was famous for boycotting elections in the past, the Socialist Forces Front (FFS), has announced it will run this time, “for tactical reasons,” according to its leader Hocine Ait Ahmed, who is hopeful that the presence of 500 international election observers is a step in the right direction for democracy in the country. Mustapha Bouchachi, who served as chairman of the Algerian League for the Defence of Human Rights before heading the FFS list in Algiers, says his party rejects the system in power but “wants a peaceful change; violence does not allow us to build a democracy,” he told IPS. A low turnout will be a disaster for the current government, the National Liberation Front (FLN) and the National Democratic Rally (RND). Both parties have thrown the full power of the state behind their electoral campaign, including the rampant use of state television and promises of distributing houses to voters. They are not the only parties defying electoral laws and regulations. Amar Ghoul, minister of Public Works and head of the Green Alliance list in Algiers is offering ten iPads to voters who will contribute to his campaign. Nearly 400 complaints, most of them related to the wasteful use of state resources, have been lodged at the National Independent Commission for Election Monitoring (CNISEL) since the launch of the campaign on Apr. 15. Both the FLN and RND have been harkening back to the pre-independence period, when the FLN was instrumental in toppling French colonial rule and ushering in a ‘liberated’ Algeria; but in a country where 70 percent of the population is under the age of 30, such rhetoric pales in comparison to the harsh reality of unemployment and poverty.